The Brazilian Bay Forum are privileged to have some fantastic members who go the extra mile to make the Forum so successful and so friendly. Not least amongst these are Darren (DazDub) and John (Scooby) who, for the second year running, organised a meeting at Daz’s house in Fairbourne, near Barmouth in Wales. The house is a former hotel and has a car park which can accommodate any number of Kombis. We couldn’t get away early enough to make the morning bike ride along the Mawddach Trail but arrived about 4.30pm and set up Absinthe for the weekend. The bikers soon returned and, whilst some ordered chips from the fish and chip shop in the village, we fried some sausages and onions for sausage butties – just what we needed. Boris “introduced” himself to Daz’s German Shepherds, Roxy and Solomon. He’s a grumpy devil at the best of times but I’ve never seen his lip curl as much as it did this weekend. No idea where he gets it from! We’d planned to walk to the beach on Friday night to have a fire but it was so windy and cold that we headed back to the house where Daz and Clare lit their chiminea and marshmallows were toasted and a few drinks enjoyed. Just as we settled in to bed about midnight, we heard Alan and Jane (Skytiger) arrive, after their long drive down from Scotland. These two certainly put some miles in supporting the various events and its always great to see their superb Van – star Kombi winner at this year’s Sleepover. On Saturday, we drove down to a nearby car park and then walked across the railway bridge to Barmouth. We waited for the fish and chip shop to open, then boosted the proprietor’s takings considerably by ordering about a dozen fish from him. After a walk round the town, we headed back to the vans and then back to Daz’s house. 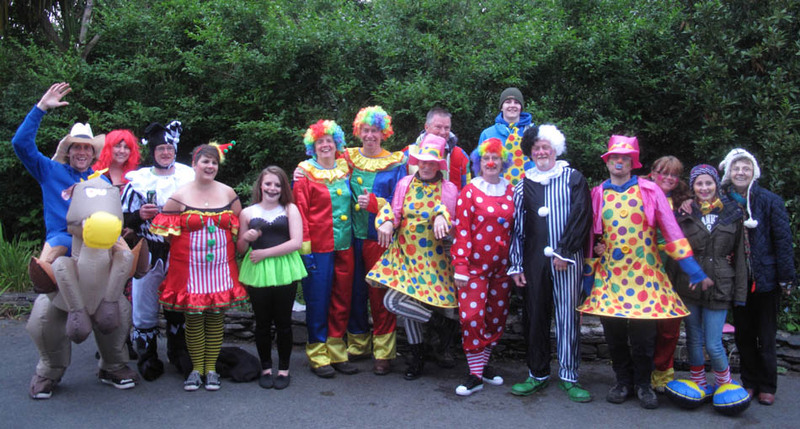 The evening brought fancy dress (of course) on the theme of clowns, a BBQ, games and a little bit of drink. Who’d have thought it? A walk had been organised for the Sunday morning but we had to give it a miss as we were moving on to a site near New Quay overlooking Cardigan Bay. The drive was ok but we went through heavy rain and feared the worse for pitching the awning. As it happened we needn’t have worried as the weather cleared and we soon had everything up. The site was quite quiet and we were able to pick our spot. Priorities? Close to the toilets and showers and within WiFi range of course. Even Boris is bored with Candy Crush Saga! The site had been recommended by Liz & Tony from the Forum and was just what we needed. Thanks Guys! There was a pub within walking distance, although we only visited it once, an excellent dog walking area and access to a walk to the cliff top way to New Quay which we tackled on Monday. Boy, was it hot? Boris was definitely ready for a drink when we got there. On Saturday we went in to Aberaeron which is a small fishing town with a decent set of shops and plenty of eateries. Other trips during the week included driving down to Cwmtydu, an old smugglers cove.The sky was grey when we arrived but Boz & I had a walk in the sea and we all chilled with a brew before moving on. Other trips included Cardigan (not much there and in any event all the shops were shut by 4pm! ), and to Aberporth where we had Fish and Chips overlooking the sea – even Boris ventured back in after his squeaky ball. Thursday was packing up day as we moved on to St David’s on a site overlooking Caerfai Bay. The site was very different, much more commercial and busier than New Quay. The hard standing was so hard that we had trouble getting the pegs in – we needed them though because whilst it was mainly sunny, there was still a strong wind blowing in off the sea. St David’s was only 10 minutes walk away which was great and the views over Caerfai Bay were amazing. We drove to Porthgain one day to visit The Sloop Inn. We’d last been there about 10 or 11 years ago when Gabrielle and Nathan were quite small, staying in a log cabin. We used to walk across fields for a couple of miles to the pub and stagger back in the dark which the kids thought was great. Saturday was our last full day so we had a leisurely breakfast and then drove down to Whitesands Bay to do a walk around St David’s Head. Boris was off the lead and happy and we really enjoyed the spectacular views and an ice cream afterwards. A great nine days – very chilled and just what the doctor ordered. There’s no 3G in Wales. How do they manage? If the van’s not level, Mrs B’s life is in danger from a rolling Mr B! Boris will take on all comers, regardless of size. Parts of the Welsh coast are, literally, awesome. Mrs B can’t have too many chips. I prefer small campsites to large commercial ones. Paying £2 for 24 hours WiFi access is fine. Paying £2 for an hour isn’t! Night time in late June can still be like Vladivostok. There’s a full set of photos here and maybe a video to follow later.